Known as The Richest Hill on Earth, Butte, Montana got this nickname from the city’s silver, gold, and copper mining heyday that lasted from 1882 to 1982. That century worth of rich heritage is preserved at the 22-acre World Museum of Mining. 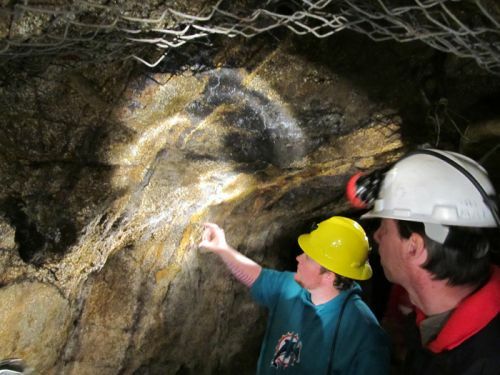 In addition to strolling through a recreated 1890s mining town, admiring a vast array of mining equipment and relics, you can also take an underground tour of the Orphan Girl Mine. Good walking shoes and light jackets are recommended. This family fun tour gives a glimpse of what hard rock mining was like for the old timers— and may just be the most realistic underground gold mine tour that you will ever take! No illuminated, paved tunnel here. Instead, you’ll be outfitted with a miner’s hard hat, cap lamp, and battery belts (they weigh more than you think). Your cap lamp is the main source of light underground, so be prepared to navigate your way in dim lighting on an uneven soggy surface. It gets a little spooky when everyone switches off the battery lights and all you’re left with is the glow of a candle. Now imagine working like that for hours on end! You won’t have a problem finding the Orphan Girl Mine while on the World Museum of Mining property— just look up. The old “gallows” style headframe juts 100 feet into the air. In fact, headframes dot the sky just about anywhere you look in the city of Butte. 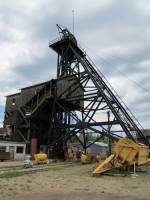 A headframe is more than a tower of steel, it allowed miners and their tools to be lowered into the mine shaft. During Butte’s mining boom, thousands of men worked in the veins below the city. Most of the Orphan Girl tour guides are retired miners, so as you walk about 65 feet down into the once 3,200-foot deep mine, you will hear their real stories. The “Girl” produced over 7,500,000 ounces of silver between 1875 and 1956. Sounds like a lot, but it’s actually only about one percent of all the silver ever produced in the entire district. The Girl got her name because, compared to many of the other mines of the day, it is relatively isolated on the western side of the Butte mining district. There is also an Orphan Boy Mine. The Orphan Girl was a popular place to work because it was usually a cool 60 degrees. Temperatures in other nearby underground mines often exceeded 100 degrees! Adult admission $8.50, seniors $7.50, students $6, and kids $3. 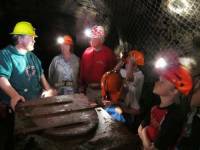 Underground Mine Tours offered daily at 10:30, 12:30 & 3:00 for an additional $12 per adult, $10 for seniors, $8 for students and $5 for kids. Underground tour not recommended for kids under the age of 5.